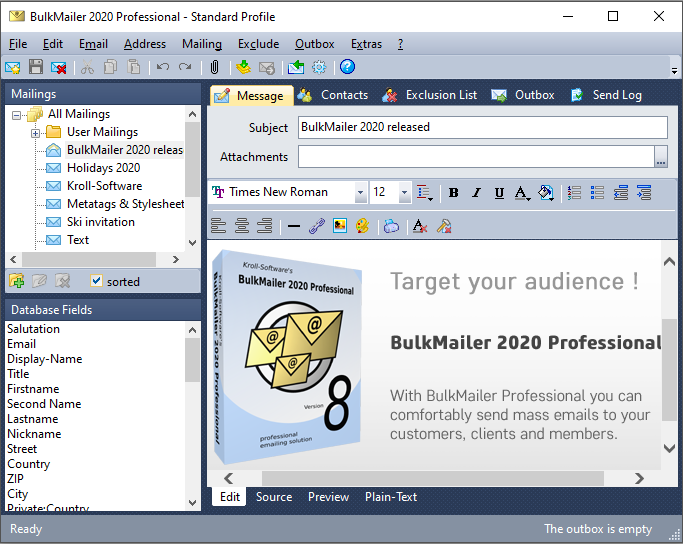 With BulkMailer you can send a large number of personalized emails with ease. Every recipient gets an individual email and cannot see the other addresses on the list. With the integrated HTML editor you compose Mailings with embedded graphics, different fonts and backgrounds. You collect the addresses in the internal database or access an existing database directly. A universal database interface allows you to import addresses from any source. Database fields can be inserted dynamically into the email body. The Feedback Module automates the handling of reply mails, e.g. subscribes/unsubscribes, bounce-management, automatic data entry from Web-Forms (for newsletter subscriptions), etc. Many other features make this software package a perfect marketing solution. You can test this software 30 days for free. During the trial period you can send real mailings. Universal database import, access to existing databases, html mails with full mime support, html editor, file attachments, bounce management, office look and feel.